Thirsty Pilgrim: Updated Fest Calendar for 2010, and Lambic Sadly Missed. Updated Fest Calendar for 2010, and Lambic Sadly Missed. In the afterglow of another terrific Kerstbierfestival, the time feels right to look ahead to next year's fests. Friend of the Blog Paul Briggs has updated his calendar for 2010. You can find it here, and I've updated the permanent link on the left. 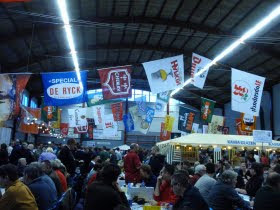 First one on the schedule: the Richement Beer Fair on January 23 and 24 in Richemont, France, near the borders of Belgium, Germany and Luxembourg. Originally a biennial event for breweriana collectors, the fair now usually includes an entertaining mix of French, Wallonian and Luxembourgish craft brewers. One event I failed to mention last weekend was the Day of the Lambic in Eizeringen, home of the Grote Dorst — arguably the world's best lambic café. What made this event more interesting than usual was the premiere of Allagash Spontaneous, a two-year-old beer made from traditional lambic methods in Portland, Maine. Maybe the only thing stopping you from calling it a lambic is the fact that it was not made in Pajottenland or Belgium, and there are plenty of people who would love to slap a geographical indicator on the word. However no such thing exists at the moment. You can call it lambic if you want. I don't mind. So, how was the Allagash sour-beer-made-in-America-according-to-traditional-lambic-methods? I have no idea. Unfortunately the excellent people at the Grote Dorst chose to have the Day of the Lambic on the same weekend as the Kerstbierfestival. Reports are most welcome. Everything soounds awesome, hope I can make it to Belgium for some festivals in 2010. Would be cool if you could rate the festivals on how many km it's worth travelling to attend. Allagsh was quite nice, a bit fruity and, if I remember correctly, with a wee touch of hops. I did, however, not beet Cantillon, 3 Fontainen, the different Boon years or the Mort Subite 06. Why must an American version of Lambic be compelled to add a "touch of hops" to a beer that is aiming to be an 'authentic' Lambic? Leave the hop influence to an IPA or other bitter beer. Just had an interesting conversation about hops and lambic with a local lambic brewer. Of course even aged hops have an influence on the final gueuze character. And even with the local, traditional lambics, there can be discernible hop bitterness after one, two or even three years of aging in barrels. But it's definitely not one of the flavors I usually look for or notice in the gueuzes I enjoy most.